Creativity is ebbing right now, so I couldn’t figure out a name for today’s map. It’s a cool little dungeon with less than a dozen rooms that I drew the other day on the inside cover of Michael Moorcock’s “Phoenix in Obsidian”. It is pretty evident that it is one of my more recent maps – you can spot my more recent dungeon maps almost entirely by the background fill. My older maps (particularly the pencil maps I scanned recently) just aren’t quite as awesome as what I’ve been drawing lately. Everything improves with practice. Today’s map was drawn in one draft, ink on plain white paper (well, the inside of a book cover) without a background grid. It is seen here larger than full size, the actual map is less than 3 inches across. As usual, feel free to use this in your games, and my usual invitation to bloggers remains open: If you want to use any of my maps on your blog, you are welcome to do so as long as I receive full credit and maintain my copyright and get a link back. 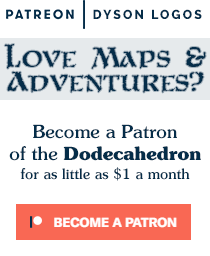 Further, if you post a stocked version of one of my maps, I’ll gladly pimp your blog right here and share the love. As a player, I do not like long, protracted dungeon delves. 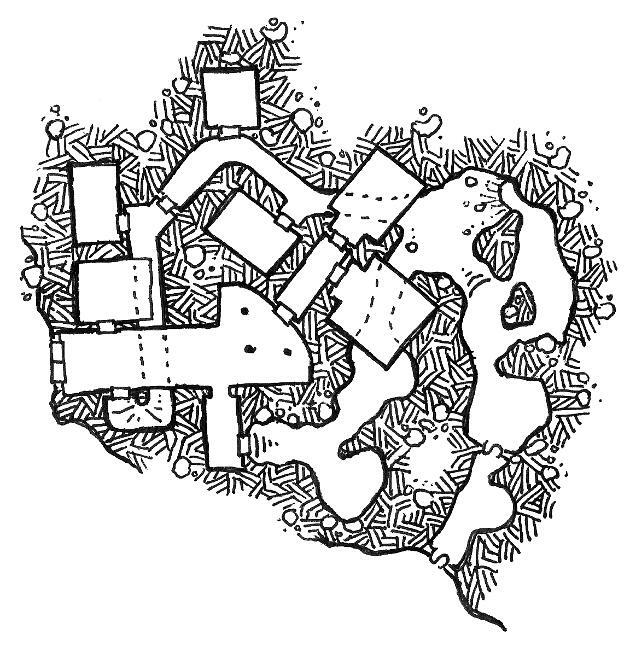 Your map, however, is perfect because it’s the type of thing that could be knocked out in a session or two. Just enough of a dungeon to tickle the palate, but not enough to be overwhelming. Very nice! I posted a Scenario for it, have a look!